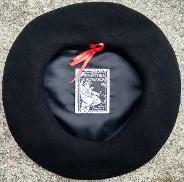 Boneteria Aotearoa is home to the world's best quality, most comfortable berets. Made by Boneteria Auloronesa - Manufacture de Berets in Oloron Sainte Marie, the birthplace of the beret in the French Béarn. Boneteria Auloronesa is an artisan company that hand makes berets in the traditional way; made of foulard quality French merino felt, fitted with a liguette or a supple leather headband. Aotearoa /ˈæɒˌtɪəˌroːə/ (noun): the Māori name for New Zealand. From Māori ao tea roa (Land of the Long White Cloud).